April and Paolo eloped in Paris. They flew all the way from Arkansas to celebrate their union in the city of love, all by themselves. WeddingLight Events planned their big day & we were lucky enough to be their wedding photographer for the day. We produced a video clip as well which will be up in a little while. We met at their hotel in Saint Germain des Près for the getting ready of the bride. 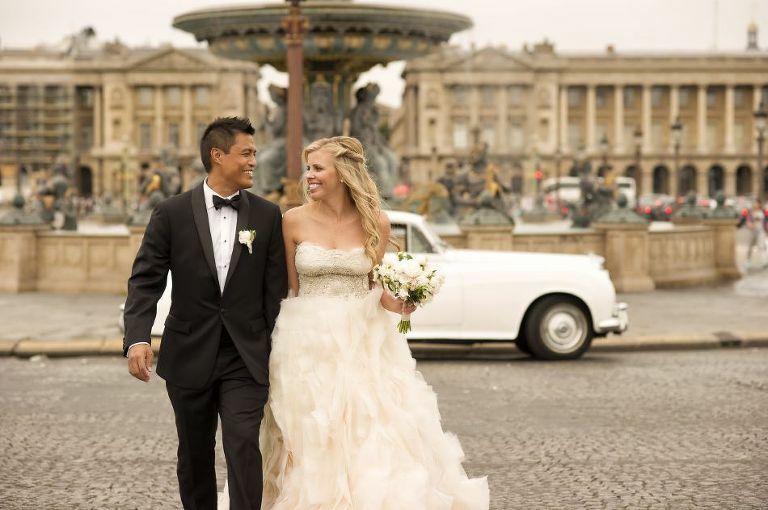 April and Paolo had their wedding ceremony in the gardens of the Trocadero. WeddingLight events had organized a harpist to play a few tunes during the ceremony. The officiant speech was modern and quite moving. I do love the Trocadero gardens for a wedding ceremony; it is very quiet, the grounds are gorgeous and yet it is footsteps away from the Eiffel tower. Paolo and April wedding photographs are quite stylish & elegant and a lot of fun to shoot. I always want to make sure that my wedding couples are going to have some fun with their wedding photographer. I want my photographs to be first and foremost fun and lively. I try to keep away from posed portraits to privilege more natural photography. I think you will get a sense of my style in those few wedding photographs. They are happy, obviously very much in love and although they both were a little shy in front of the camera at first, I managed to make them smile a lot in front of the lens! We did have a wonderful time traveling the streets of Paris in a gorgeous white Bentley. Our photographic journey took us to the gardens of the trocadero for the ceremony as well as the pont Alexandre III, the place de la Concorde and the gardens of the palais royal.